The Archdiocese of Dublin will have two new priests as Archbishop Diarmuid Martin ordains Paul Glennon and Chris Derwin to the Diocesan priesthood. The ordinations took place on Wednesday 3rd June, the Feast Day of St. Kevin, a patron saint of the Archdiocese. Paul Glennon is originally from Dunmore in County Galway. A son of John and Mary Glennon, his parents, four bothers and four sisters will all join him as he is ordained in St. Mary’s Pro Cathedral. Paul (41) studied mechanical engineering in GMIT Galway, Bolton Street and Paisley in Scotland. Following graduation he worked for three years in Manchester and later in Kilbeggan in Co Westmeath. He was in his 30’s before he began to explore a vocation to the priesthood. He took time out from his career to study in the Emmanuel Community School of Mission in Rome, living in the community and working on parish missions. He entered St. Patrick’s seminary in Maynooth in 2009 and as well as his studies in St. Patrick’s he also spent time in formation in two Dublin parishes. Chris Derwin is from Milltown and Rathmines in Dublin. Aged 32, he will be the youngest priest in the Archdiocese of Dublin. A son of Rita and Christopher, he has three brothers and one sister. From a young age and for many years Chris was a carer for his grandmother and three uncles and still cares for one elderly uncle today. He studied in Dundrum College in Dublin and Leeson Street Institute of Education. He then embarked on a career as a barman, taking an apprenticeship in the trade. He worked in several well-known Dublin pubs including Graces in Rathmines, Tramco and Madigans. During this time he also volunteered in local youth projects. He said he had drifted from his faith in his early teens but returned to his local parish after the age of 16. However, he struggled with his vocation and says he immigrated to Manchester to work for a two year period in a bid to ignore the calling, this in fact had the opposite effect and he ended up joining St. Patrick’s Seminary in Maynooth in 2008. Both men were ordained by Archbishop Diarmuid Martin during the 11am Mass in St. Mary’s Pro Cathedral. In his essential and limpid autobiographical account published in 1997 – the original German is entitled Aus meinem Leben: Erinnerungen 1927-1977 (Milestones: Memoirs 1927-1977) – Joseph Ratzinger remembers with vivid simplicity his ordination to the priesthood. 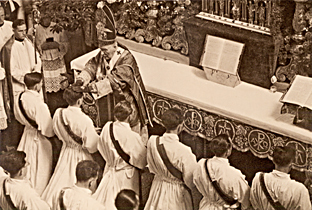 The great German Catholic Cardinal, Michael von Faulhaber (1869-1952), distinguished biblicist and patrologist, Archbishop of Munich and Freising from 1917, who during the dark years of the Third Reich had become one of the most courageous critics of Hitler’s regime, laid his hands on the 24-year old deacon in June 1951 and on his older brother Georg and 42 other young men. There then followed four summer weeks that were like an unending feast. On the day of our first Holy Mass, our parish church of Saint Oswald gleamed in all its splendor, and the joy that almost palpably filled the whole place drew everyone there into the most living mode of “active participation” in the sacred event, but this did not require any external busyness. We were invited to bring the first blessing into people’s homes, and everywhere we were received even by total strangers with a warmth and affection I had not thought possible until that day. A priest for sixty years, Joseph Ratzinger carries out daily, with humility and transparence, the work of making the one Lord of the world and of history present to women and men of our time. 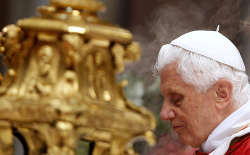 For this, the Osservatore Romano offers Benedict XVI its best wishes, sure that its sentiments are echoed not only by those in the Catholic Church but by many others throughout the world. And repeats for him the words of the ancient prayer for the Pope, invoking Christ’s protection and the only happiness that counts: Dominus conservet eum, vivificet eum, beatum faciat eum in terra et non tradat eum in animam inimicorum eius. 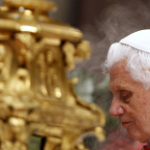 Pope Benedict XVI celebrated Mass marking the feast of Saints Peter and Paul, patron saints of the city of Rome. During the Eucharistic celebration, the Pope also conferred the Pallium on 41 new Metropolitan archbishops, from countries all over the world, who have been appointed over the past year. Attending the Mass in St Peter’s Basilica on Wednesday morning was a special delegation of three Orthodox leaders representing the Ecumenical Patriarch of Constantinople, Bartholomew I, part of a traditional exchange of ecumenical delegations which has helped to strengthen the bonds of friendship between the Churches of the East and West since shortly after the 2nd Vatican Council. But the Mass also marked a personal moment of reflection for the Pope himself who was celebrating the 60th anniversary of his own ordination to the priesthood. 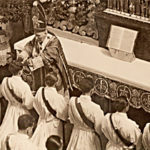 In his homily Pope Benedict said that sixty years on from his ordination, he can still hear the words that were addressed to the new young priests that day in 1951, the words of St John’s Gospel, ‘I no longer call you servants but friends.’ Words, the Pope added, that bring great inner joy and can also be seen as the entire programme of a priestly life. “Friendship is not just about knowing someone, it is above all a communion of the will.. Reflecting on the meaning of that friendship with Christ, the Pope said it is above all learning to grow in ever greater conformity with His will, to know Him better through the Scriptures, through prayer, through the communion of Saints. Jesus’ words on friendship, he said, should be seen in the context of His commission to His followers to go and make disciples of all nations – a command which challenges us to move beyond the boundaries of our own world and to bring the Gospel to all people. After his intimate reflection on the meaning of his own priestly ministry, the Pope also greeted the Orthodox delegation present in the Basilica, as well as the new Metropolitan Archbishops who received the white, woollen Pallum, a symbol of service and a sign of a communion with St Peter and his successors. Pope Benedict concluded with heartfelt words of thanks to the Lord for the past six decades of his own service to the Church, as well as thanks to all the people who, he said, have formed and accompanied me. In the silence of this moment ask the Lord to reveal to you the depths of his love and give us his peace. One of Irelands leading Iconographers, Sr Aloysius McVeigh, a Mercy Sister, from Derry, has provided us with an appropriate icon as the focus of our prayer. The icon depicts the face of Christ. Its title is ‘Achieropoitos’ (image not made by hands), and is based on the shroud of Turin. This image is very appropriate as it is Christ who is the one who calls us to our true vocation in life– the vocation of holiness. The theme of the prayer endeavour is ‘Seek his face’. This icon was blessed by his Holiness Pope Benedict in Rome over Easter and will travel around our diocese spending a week in parishes encouraging parish communities to pray for vocations. Where is the Lord Calling You? You love me and you want me to be happy and at peace. Help me to seek your face each and every day of my life so that my life can be spent in your service.